An Asteroid Is Passing Very Close To Earth Today. Here's How To See It : The Two-Way At its closest point, asteroid 2004 BL86 came within about 750,000 miles from Earth — or almost three times farther away than the moon. 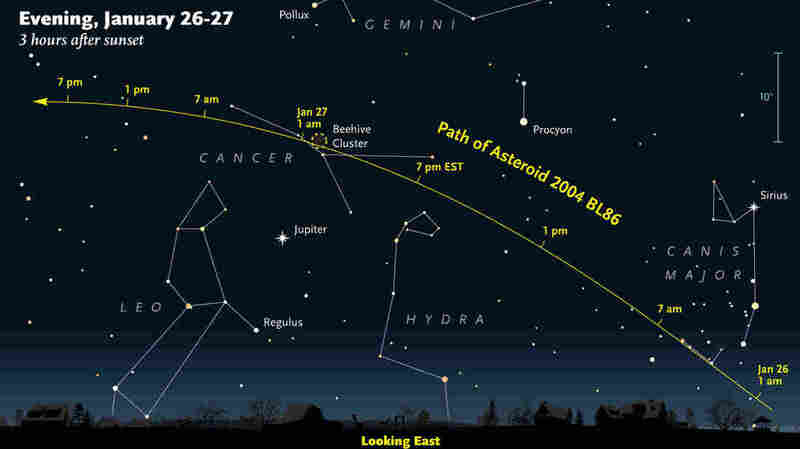 Asteroid 2004 BL86 will be visible in parts of the sky tonight. Visibility is expected to peak around 9 p.m. ET, as shown in this NASA graphic. By the time you read this post, asteroid 2004 BL86 will already have come as close to us as it's going to get as it flies by Earth. At about 11:19 a.m. ET today, it was nearly 745,000 miles away from our planet. That's only about three times the distance from the Earth to the moon. But don't worry, you may still be able to catch a glimpse of the huge hunk of rock tonight. When and how can I see the asteroid? The best time to observe BL86 is around 9 p.m. ET, according to Sky & Telescope, though visibility is expected to be good from 8 p.m. to 1 a.m. Tuesday. The magazine says people in North and South America, Europe and Africa will have the best view. Check out NASA's map of the asteroid's trajectory here, along with other star maps here and here. You'll need a telescope or a decent pair of binoculars. David Agle of NASA's Jet Propulsion Laboratory emailed us these tips: "Find Jupiter shining brightly on the eastern sky and aim your binocular or telescope ~10 deg above. You need good binoculars (~50 mm aperture) or a small (3-4 inch) telescope and a star chart." Agle says the asteroid will appear brightest at around 11 p.m. ET. Astronomers think the asteroid is about a "third of a mile" in size. Or as NPR's Geoff Brumfiel tells our Newscast unit, it's about the size of two Rose Bowl stadiums. Does it pose any danger to Earth? NASA's website says BL86 poses no threat to our planet. What will be the asteroid's path through the night sky? "The asteroid moves from the south to the north, from below the Earth's orbit to above," NASA says, adding that it will pass near "a brightly shining Jupiter in the eastern sky." The asteroid will pass over the Hydra constellation around 7 p.m. ET and then skirt very close to the Beehive Cluster and Cancer constellation around 1 a.m. ET. The asteroid should appear brightest when it is nearest to the Beehive Cluster. How often do asteroids pass this close to Earth? Agle writes that "Monday's flyby was the closest approach the asteroid will make to Earth for at least the next two centuries. It is also the closest a known asteroid this size will come to Earth by any known object this large until asteroid 1999 AN10 flies past Earth in 2027."